Seven braces, six shoe lifts, five sets of crutches, four reclining wheelchairs (sizes XS, S, M, L) three walkers, two canes, and one wheelchair ramp – this represents six years of surgeries and dealing with Perthes for more than nine years (2.5 years were misdiagnosed). We are living proof that God can move mountains and everything is in His time. I’m so happy to report that Christopher is doing well for the first time since 3rd grade!!! He was part of the junior varsity high school swim team and they won district! He also enjoys the competitive men’s choir and is maintaining a 4.0 GPA. Today marks the 3rd anniversary of Christopher’s failed head-splitting osteotomy surgery and hip fracture (two days later) during the first physical therapy transfer in the hospital. I’m so glad those days are behind us. The total hip replacement was the best decision we ever made because it gave him his life back – pain-free!!! Always follow your instinct. It will not lead you in the wrong direction. If it feels right, then God is leading you down the correct path. Ask for your medical records, and if they do not give them to you, go to the person higher in the chain of command. Those are YOUR records and you can learn a lot that your physician will never tell you in person (like a cut was made too deep and caused your son’s hip to fracture – not to mention the bone was too soft). Do not attempt a head splitting osteotomy until the bone is hard enough to handle the surgery. You may be tempted to rush into that surgery because your child cannot walk and is in a wheelchair. Be patient and make sure it is the right time. We are living proof of how terribly wrong it can go. Join a Facebook Perthes group, I have had the best sounding board over the years from the Perthes Warriors that went before us and we are there for those that are just beginning the journey. Never allow your child to see how scared you are for them. Half of this battle is mental and you need for them to stay positive. I never allowed pity parties to go on for more than a day. Life gave us lemons and we made awesome lemonade! A shower is a perfect place for a good cry. I cried for four months straight once we knew he had bilateral Perthes. He never knew how sad I was for him. Your closest friends and family will not understand what you are going through during this time. Our Perthes family knows what we endure daily and the fears/joys. Lean on them during your darkest days. One day the sun will shine again. No two Perthes patients are the same. We are all like snowflakes and each case is different. One child will have a light case of Perthes with no surgery and return to living life quickly and another one will have a severe case and will endure multiple surgeries and sit on the sidelines. Enjoy the small victories! First time to walk without crutches, walker, wheelchair – just know that things can change quickly so enjoy the moments. Your child will more than likely become a wise, compassionate person because of Perthes. 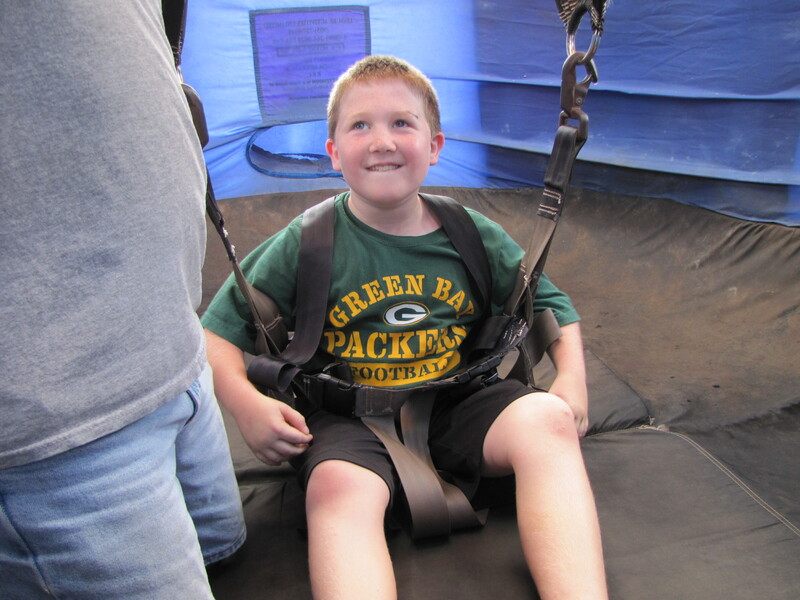 Christopher isn’t sad he had Perthes because he knows it molded him into the person he is today. We are enjoying the moment and are currently pain free!!! I wish the same for all of our Perthes Warriors. Never give up because one day you will have both feet on the ground! Christopher’s total hip surgery was uneventful and Dr. Harrington was able to give him back all the limb length difference. We were told it would be close but it turned out better than expected. The catch to this is his sciatic nerve, muscles, and tissues have to account for 4 centimeters. He did lose feeling from his knees to toes but we finally figured out it was the compression stockings (for blood clots) cutting off all circulation. Methodist Hospital had great nurses. They kept referring to Christopher as the ‘baby’ on the floor since all the other orthopedic patients were much older. Two Feet on the Ground! Christopher started walking the day after surgery. He was on cloud 9 when he realized his knees were the same length when he was sitting. We never stopped to think about the possibilities of having both legs the same length again. We were all in tears and giving thanks to God. 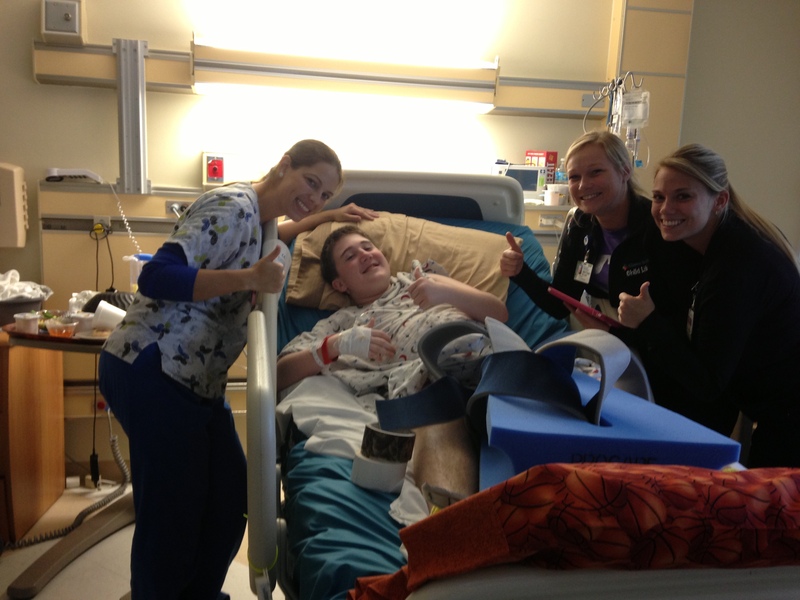 This is the photo of him while the spinal block was still working. He hasn’t been completely pain free since this photo. Total hip replacement makes all the other 8 surgeries (on this hip) look like child’s play. It’s not for the faint at heart. 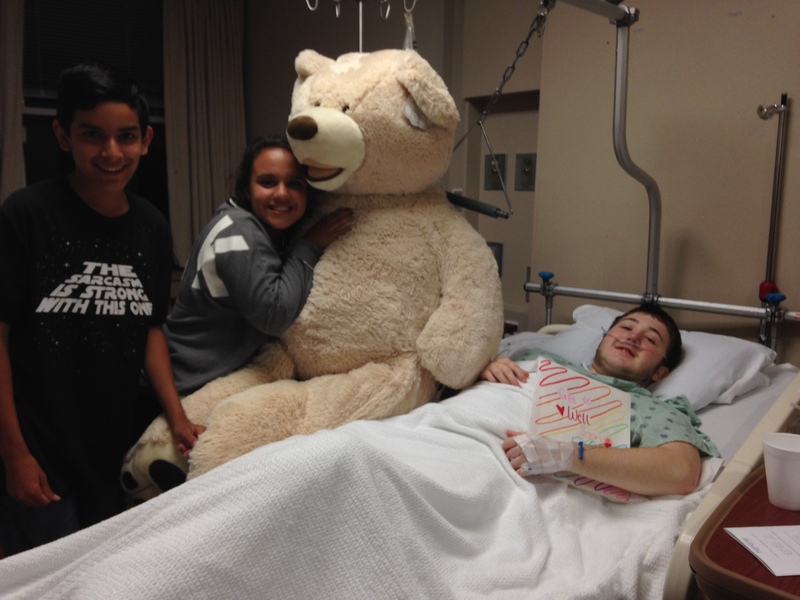 Isabella brought Christopher a life-size teddy bear because he is a ‘beary good friend’. Noah came too. I have to thank Giannela, Eric, Isabella and Milana for everything. I don’t know what we would do without you guys. Nana came in for the surgery as well. She’s our rock! Thank you to everyone that texted, called, tweeted, posted. We had more than 200 messages. I hope I responded to everyone but if I didn’t please know we really appreciated it. We could feel those prayers! 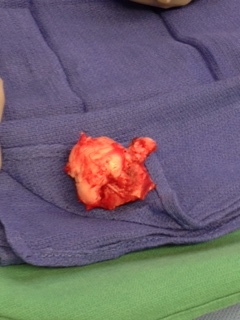 This is what Christopher’s hip looked like – it had a large bone spur on the side. It’s hard to believe that even could fit in his acetabulum. No wonder he was in so much pain. The bone spur came back three times in the exact place. It’s not a thumb! It’s a bone spur! I realized a long time ago that Christopher would not be able to play flag football, kick a soccer ball into the goal, run across home plate or make an outstanding rebound. We dreamed these things would be possible because he loves sports so much. 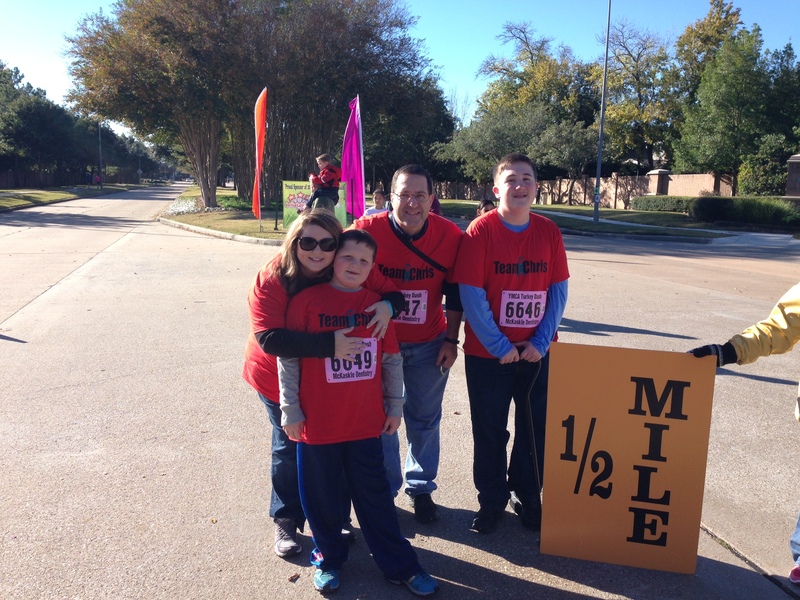 We thought he was well on his way to accomplish some of these goals with the last surgery. He was finally walking and even did some very light jogging but God had a different plan. 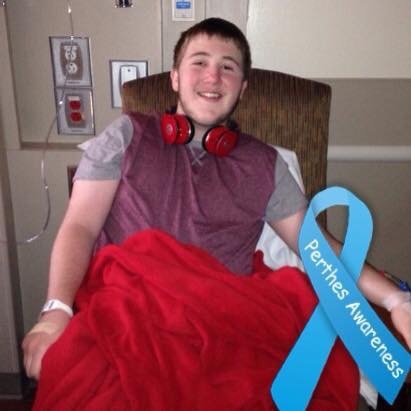 Perthes is going to do what Perthes is going to do. Christopher finally admitted to me that he was still in a lot of pain (especially at night). He fell on a concrete drive after one year post-surgery. This shouldn’t have made a difference but two weeks later he put himself back on crutches. Dr. Paley asked to see us immediately and at that appointment he said Christopher’s hip was impinging for the third time. He told us we were running out of options. 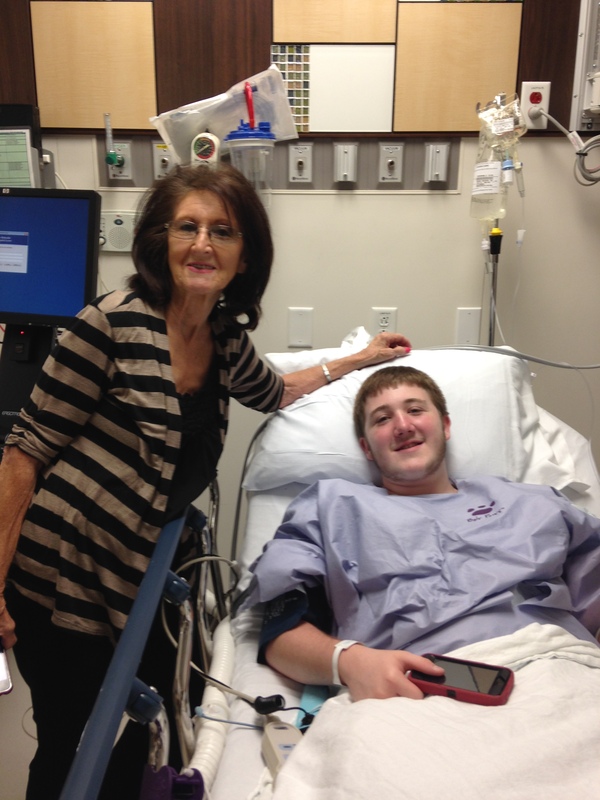 Our next step was to see a specialist in Colorado for arthroscopic bone shaving. We never made it to this appointment. I had just left for a week to work a medical software conference in Chicago and when my plane landed, my phone lit up like a Christmas tree with messages from home. Christopher: Mom, I had a major hip attack. Me: Oh no! What is your pain level? Me: Did you mistype that number? Christopher: No. It hurts so bad. Christopher: Breathing. I was just sitting. His buddy Byron came for a visit. He had an appt in the medical center. I’m grateful to my awesome boss and the owner of the company. Both Judy and Joel told me to go home but I felt torn. I wanted to be with Christopher but I also needed to do my job. Judy asked me what Christopher wanted and then it was easy to see that I needed to return home. 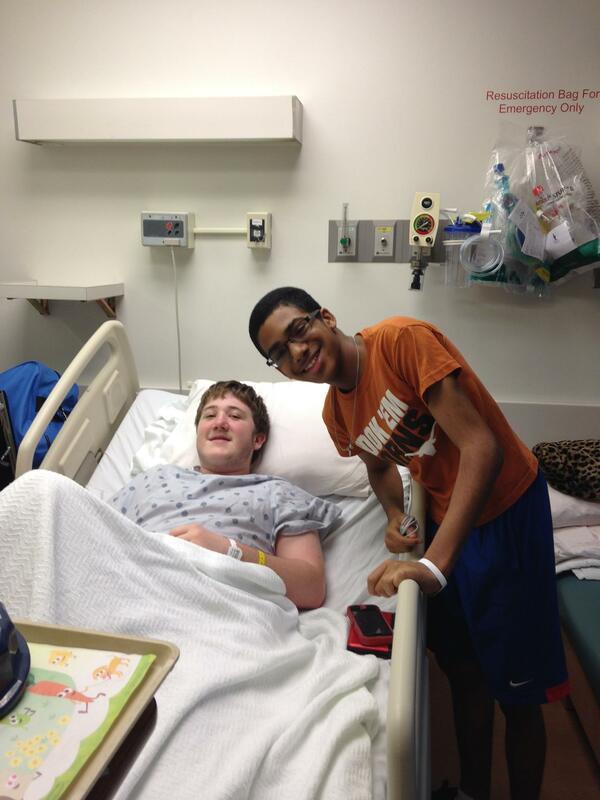 Chris was admitted into Texas Children’s for four days for pain management. His hip was beginning to sublux internally and was extremely painful. None of us saw this coming. Dr. Paley’s team worked with Dr. Scott Rosenfeld’s team to figure out how to manage the pain. Only morphine with Tordol would break through the pain. I knew we were in some serious trouble. The physicians all said non-weight bearing with toe touch only. I knew we couldn’t handle this blow but I knew at that point God was carrying Christopher and my family. Dr. Rosenfeld talked to us about hip fusion but also gave us three names of the top total hip guys in Houston. I had tried to see them a year ago but no one would even consider a total hip because of Christopher’s age. This time, it was completely different. We purposely went to the conservative physician first and we were shocked when he said, ‘I have bad news for you. You need a total hip replacement (THR).’ Then, we proceeded to see three more physicians after him – all with the same opinion. Even Dr. Rosenfeld changed his tune and began to tell us all the reasons why a hip fusion might not work for Christopher. We consulted the total hip physicians in St. Louis, New York, and Baltimore and they all agreed the only option was THR. 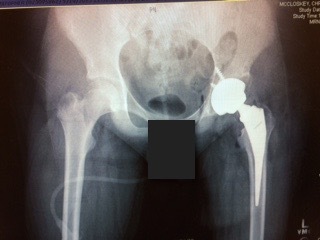 So, we are scheduled for a 30-year hip next Thursday, May 14th at Methodist Hospital in the Medical Center. God is totally in the driver seat and we didn’t pray for healing but to hear His will. That’s the one lesson we have learned from this journey. Please join us in praying for a long hip replacement with no complications. If you want to send Christopher a greeting card while in the hospital, please follow the link below. It’s hard to believe it’s been more than a year since the new journey began. Sometimes this year went very slowly but for the most part it flew by. A lot can happen in a year! God blessed us beyond measure! We will start the journey again to become pain-free and walking. 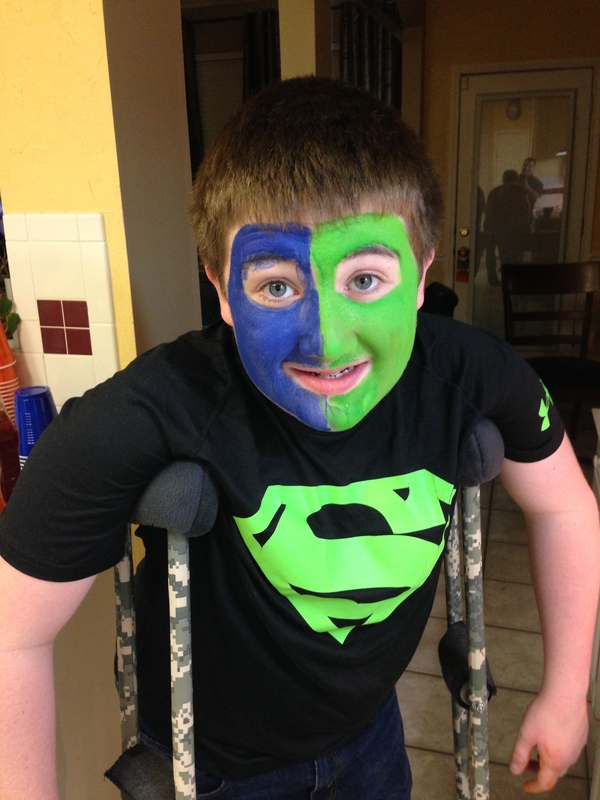 1/21/2014 – Surrender to God to heal Christopher – he still wasn’t walking after the major head splitting osteotomy on 2/13/2013. 2/21/2014 – Visit Scottish Rite Hospital to get the advice of Dr. Kim. He sets up a team of physicians to see Christopher’s case. They suggest hip fusion but give us the truth about how difficult that surgery will be physically and mentally. We decide it’s not the surgery for us. 2/27/2014 – Visit Dr. Paley at the Paley Institute. He evaluates Chris and suggests an external fixator for four months. We are told it may be late summer due to busy schedules. We are driving away when the scheduler calls us with a surgery date of April 9th. 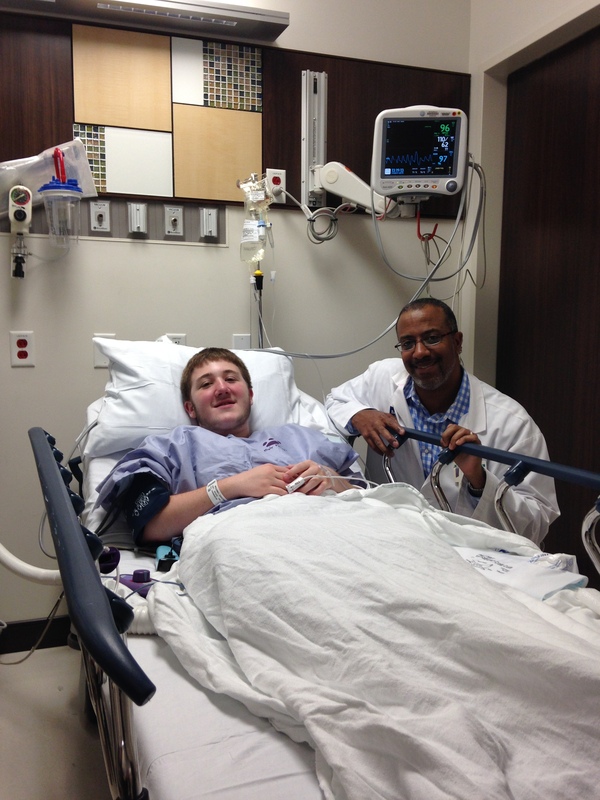 4/9/2014 – Major hip surgery #8 – all internal fixation screws are removed with a head shaping osteotomy. 9-day hospital with stay with Constant Passive Motion (CPM) machine with epidural. We cannot have the external fixator due to cartilage damage. 4/9 – 18/2014 – St. Mary’s Hospital stay with the nicest nursing staff in this country. 4/15/2014 – Husband flies home to start new job. 4/9 – 5/13/2014 – Christopher and I are staying in a hotel room with physical therapy everyday while still using the CPM machine and brace. He is only out of the CPM machine 2 hours a day, on heavy pain meds, and can only toe touch with a walker. 5/13/2014 – Come home to a newly, remodeled home thanks to Dominic and the Kingsland Baptist family. There are not words to express our thanks. 9/05/2014 – Meet with Dr. Paley and are told we need to be more aggressive in physical therapy or it’s another big surgery in our future. Chris gets to work. 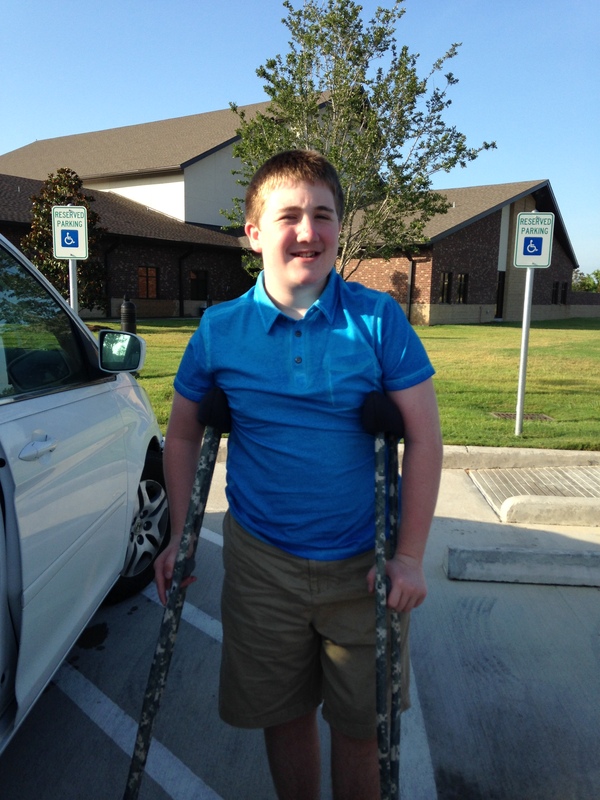 9/12/2014 – Christopher starts walking without crutches. 11/27/2014 – Christopher walks in the YMCA Turkey Dash with a cane only. It is gone within a week. 12/10/2014 – First time to get through airport security in less than 10 minutes because we do not have a wheelchair. 12/11/2014 – Dr. Paley is impressed with Christopher’s walking. Removes all restrictions and is very pleased with Christopher’s progress. He doesn’t want to see us for a year. 3/15/2015 – Major pain while walking. Christopher is back on crutches. 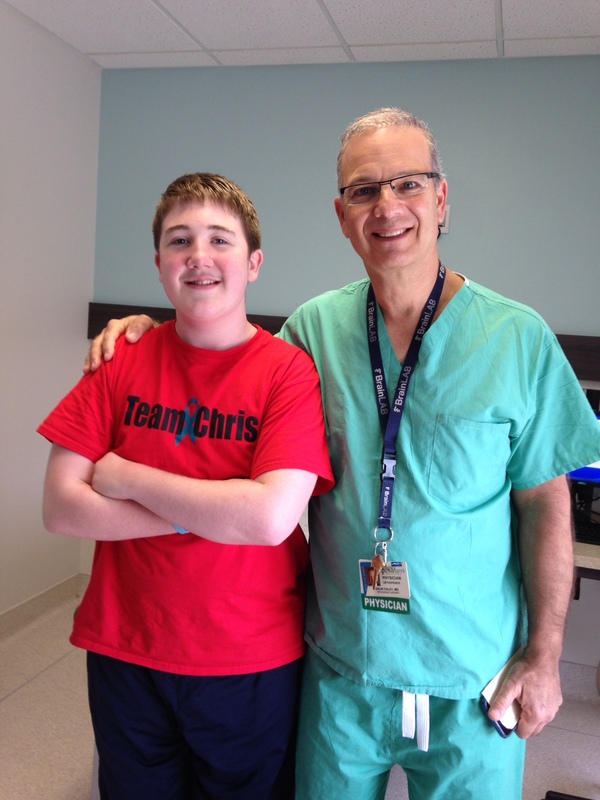 Dr. Paley wants to see Christopher urgently on Monday, March 23rd after seeing x-rays and wants him to guard the hip. We have come full circle but we know God is holding Christopher in the palm of his hand. To say we are heartbroken is an understatement. He was walking fine over the weekend but I knew something wasn’t quite right a couple of weeks ago. That Mommy intuition is strong but I was praying to be wrong. We’ll see what Monday brings. Never doubt your instincts! Our sweet warrior has prevailed with the grace from God above. All the glory goes to Him in the highest! Christopher is walking, running and jumping!!! Three months ago he was on crutches! Our only wish for the last four Christmas’s was for Christopher to walk and God has blessed us with this miracle! We would like to thank our God in Heaven, our awesome Dr. Paley and Stacy/team at Spero Rehabilitation! We saw Dr. Paley on December 12th and the smile on his face was incredible. We heard words like ‘whoa’, ‘amazing’, and ‘fantastic’ while Dr. Paley watched Christopher walk briskly down the hall. He told Christopher, ‘you have far exceeded my expectations’. Christopher doesn’t have to see him for a year!!! This is the best Christmas present that money couldn’t buy!!! We hope each and every one of you have a very blessed Christmas filled with love, laughter and health and a Happy New Year! We were told back in February that Christopher’s only choice was a hip fusion or total hip replacement and I wouldn’t accept his fate so I went on a quest to find a new way. Thanks to the vision of Dr. Paley he is walking. That’s right, he is WALKING!!! Plus, he is not just walking, he’s walking WITHOUT pain. Do you know how big that is for us? All the glory goes to God!!! God granted us the vision and carried us through these very dark times. I didn’t update the blog after our visit in August because it was a really bad report and I couldn’t bare to say it. Dr. Paley said he wasn’t fully rehabilitated and that he would need another surgery, a valgus osteotomy, in three months. Christopher also has one place that lost cartilage and was bone-on-bone. At that appointment, Dr. Paley’s Physician Assistant – Dr. Servando pulled me to the side and said, ‘go home and really work on walking. You guys can do this!’ We go back to the Paley Institute December 12th and I know they will be happy with the results. Christopher still has a cane but every day he is getting stronger and stronger. For once we can dare to dream what it will be like to have him completely healed. I still tear up thinking about the possibility. It has been so close many times and then the shoe would fall. This time, we will make!!! This year we can finally participate in our local YMCA’s Turkey Dash. Every year we can hear the announcer from our back yard. Christopher’s awesome physical therapist along with friends and family will be there for Christopher to walk the one mile. We will not take a wheelchair, walker or crutches – only a cane (just in case). It makes my heart smile to know that he CAN do it this year. We are so thankful and blessed this Thanksgiving! It’s that time again – the dog days of summer are over. I would love to say Christopher is completely healed and can walk on his own two feet but I cannot do so. We have been going to physical therapy three to four times a week. He is better but he is not there yet. Unfortunately, he has to use crutches to get around. He has progressed but his quad muscles are still so weak. He started a private school this year and it’s such a blessing! We miss our friends at Jr. High but I couldn’t go one more year with home bound. We have done that for three years! God works in mysterious ways and I am grateful! The newest issue is the left knee is hurting and there is severe pain in the outside lateral hip. Dr. Paley wants to see him and we are scheduled for September 5th. I personally think it’s the trochanter screws. He has had 9 pins in that hip and every single one of them have backed out. I doubt the last two are going to be any different. I’m not a physician but it’s just my hunch. I sure hope that is the cause of major pain that is referred to the knee. Also, I’m sure the MAJOR growth spurt that occurred over the summer didn’t help. He went from 4’9″ to 5’7″- I’m serious. It’s fun to watch the reactions of people that haven’t seen him in a while. Everyone is always so shocked when he stands. I’ll update once we know more – on to the next chapter. The tall Christopher – Today!